Commencement marks the culmination of our dedicated students’ experiences here at Rutgers University-Camden and celebrates the beginning of their very promising futures. 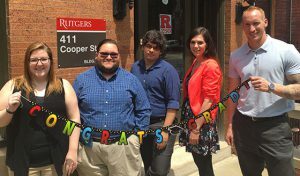 The staff of the Senator Walter Rand Institute for Public Affairs would like to extend their congratulations and warmest wishes for a bright future to our May 2016 graduates. Jessica McConnell graduated with an MA in Criminal Justice. As a Student Project Assistant at WRI, Jessica worked on the United Way of Salem County project and the Pascale Sykes Foundation’s South Jersey Strengthening Families Initiative. Jessica is now a Research Project Assistant working full-time on the Pascale Sykes Foundation’s South Jersey Strengthening Families Initiative. Michael Medina graduated with an MA in Criminal Justice. As a Student Project Assistant at WRI, Michael worked with the Pascale Sykes Foundation’s South Jersey Strengthening Families Initiative. Michael hopes to pursue a career with the Drug Enforcement Administration. Alex Ruiz graduated with an MFA in Creative Writing. As a Student Project Assistant at WRI, Alex maintained the WRI website, newsletter, and assisted with Social Media tools. Alex has moved to Ashville, NC to marry his fiancée and to pursue his career goals. Lauren Snow graduated with an MPA. As a Student Project Assistant at WRI, Lauren worked primarily on the Cumberland County Prevention Project. Lauren aspires to continue her public-sector work by focusing on program evaluation and policy advocacy, but continues to work at WRI through the summer. Reid Hlavka graduated with a BA in Psychology. As a Student Project Assistant at WRI, Reid worked on the Pascale Sykes Foundation’s South Jersey Strengthening Families Initiative. Reid will be pursuing a Ph.D. in Clinical Health Psychology from East Carolina University. Page last updated by Senator Walter Rand Institute for Public Affairs at 2:45 pm July 14, 2016 . This page was printed from http://rand.camden.rutgers.edu/2016/07/14/2016-grads/ at 4:19 PM Monday, April 22, 2019.